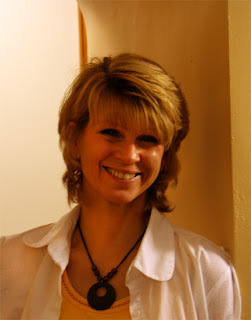 I am thrilled to have the talented children's author, C.K. Volnek, today as my guest on the J.Q. Rose blog. I enjoyed reading her book, A Horse Called Trouble, so much, I contacted her so we could get the word out on this book you'll love. It's my pleasure to be a guest on her blog today, what we refer to as blog swapping. Please take a minute after visiting here to click on over to C. K.'s blog, the Mind's Eye. Hello. Oh, I thought we were meeting C.K. 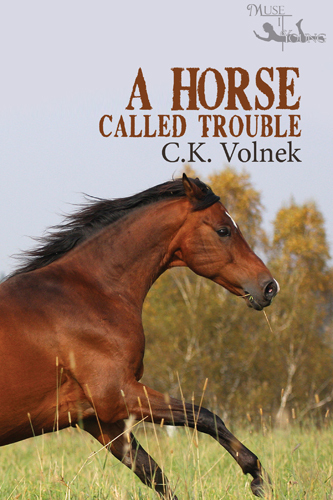 Volnek today to discuss her book, A Horse Called Trouble. Sorry. C.K. asked me to take her place today. My name is Tara and this is the story of how Trouble and I met. C.K. says I need to get out and meet our readers. I do like meeting you all. I never used to be comfortable meeting new people. I was always afraid of getting put down and pushed around again. But now since I’ve met Trouble and moved to Freedom farms, I have found I’m more confident and trusting. Oh, how wonderful. Can you tell us a little bit about A Horse Called Trouble? Sure. I was so happy when C.K. decided to write A Horse Called Trouble. It’s a horse story…of course. Lol. I’ve always loved horses, though until I was sent to this horse therapy program I’d never been around one in real life. Now, after everything Trouble and I have been through, I don’t know how I could live without him. He’s taught me so much. How old are you, Tara? I’m 13. I’ll be starting high school in the fall. I used to be afraid to go to high school. I just knew I would be miserable. I was always miserable. I never had any self-confidence and got pushed around a lot. Now, after meeting Trouble, I think I can handle it. I’ve made some friends and feel confident I can do it. Good for you. Where are you from, Tara? I used to wish I lived somewhere beautiful and green, like some place out of a travel magazine. But I’ve always lived in this dirty city. With it being in the mid-west, one would think there would be more green. But not so in the part I grew up in. It was all concrete and garbage. If something did try to grow, it was choked out by car exhausts and people tramping it. Once, I found a bunch of ‘Little House on the Prairie’ videos in the dumpster out behind our apartment and I watched them over and over at Grandma Kay’s. (She wasn’t my real Grandmother, but I loved her as if she was. She took care of me when Mom was gone or drunk.) Anyway, I used to dream about running in the tall grass like Laura Ingalls does in the show. I never thought I would ever see that much grass. But going out to Freedom Farm was like a dream come true. There is so much grass and tons of trees. It’s the most beautiful place in the world. At first I didn’t want to be at the farm. I was sent there because I’d been set up. I didn’t take Alissa’s purse…and she knew it. But it was just like her to get me kicked out of our school for it. I learned a long time ago to just keep my mouth shut and try to stay as low as possible to keep off everyone’s radar. Everyone expects me to be trouble. Partly because Mom was a drunk and dumped me, leaving me to fend for myself in foster care. I quit trying to prove to everyone I wasn’t bad. I couldn’t win. Then I met Trouble. Kind of funny, him being named Trouble. But we had a lot in common. And it’s because of him that I can hold my head high now. I never thought I’d ever feel confident or find happiness. Freedom Farms sounds like a wonderful place. Sigh. It is. It’s beautiful. I’d never smelled lilacs before I went there. Oh my gosh, I loved it! My first day, all the kids were gagging because of the barn smells. It was pretty bad. A guy was cleaning out some really raunchy stalls. But once I got past that, the smells grew on me. I even found myself liking the smell of horse sweat. Ha! The farm is just outside the city, though it feels like it’s light-years away. It’s fresh and green, with tons of open spaces. Wide open pastures and white rail fences. Horses of all colors and sizes. Peaceful. And quiet. You can even see a million stars from there. You talked about a Horse Therapy Program. What is that? It’s a really neat program. In this particular program, they bring troubled kids and horses together. The horses are our teachers. I thought the instructor was so stupid the first day when she said that. How was I going to learn anything from a horse? But they do teach us—a lot. Horses could walk all over us if they wanted to, but instead they choose to work with us…if we work with them. They teach us about teamwork, respect and trust. I’ll never forget the first day Clancy tried riding. Clancy is one of the other kids in our program. He was not working with Homer and Homer let him know it. I couldn’t help but laugh. Yeah, that didn’t go over so well with Clancy. I thought he was going to kill me. You have to understand, Clancy ruled Marvel’s. Or so he thought. I accidently kicked him where no guy likes to get kicked the first day I got to Marvel’s. I didn’t mean to. He dumped me out of ‘his’ chair and my leg just kicked him there. Anyway, ever since, he’s been after me. I tried to stay out of his way and hoped he’d forget. Except Alissa wouldn’t let that happen. Alissa is a girl from my other school. She hates me. And I don’t know why. And she is so mean to Trouble, too. That was one of the things we had in common. I had to stop her from hurting Trouble. Trouble is a great horse. And he’s so beautiful. He’s what they call a bay—red with a black mane and tail and a white blaze down his face. At first I was scared of him. He was wild and crazy, ready to kill anyone in his path. But I can see why, knowing Alissa. If I hadn’t met him, there’s no telling what would have happened to him…or me for that fact. He saved me as much as I saved him. …at ckvolnek (at) yahoo (dot) com. They can also find her on Facebook (C.K. Volnek) or Twitter (CKVolnek), Good Reads, and Jacket Flap. as well as other great on-line bookstores. So, on behalf of C.K. Volnek and me, thanks again. We’d love for you to leave us a comment. How about an excerpt to tantalize the readers? The massive barn towered up, into the Midwest sky, a prison of whitewashed boards, sunlight glinting off it. Might as well be barbed wire. Tara Cummings blinked, momentarily blinded. So this was her punishment—horse therapy? She shook her head, letting her mousy brown hair fall over her face. Another time she would have been thrilled to be here, to see a real horse, to actually touch one, not watch it on TV or the internet. Her fingers tightened into a fist. This time was different. This was a sentence of shame—for something she hadn’t even done. She didn’t steal Alissa’s purse! Tara struggled to swallow the lump in her throat, the dryness in her mouth refusing to release the knot. Alissa had set her up—she was sure of it. She’d planted the purse in her locker. Why? What had she ever done? Because she wasn’t cool…or popular…or wear designer clothes? Because she was a foster kid? Resentment and desire burned as one in her chest. She’d never have money or popularity. She’d been born a have-not and the world was making sure she would always stay a have-not. A cool morning breeze blew across the farmyard, cold fingers reminding the world that despite the sun and the absence of snow, it was only early spring and summer was still a long way off. Tara shivered and withdrew into her shabby sweatshirt, wrapping her skinny arms up in its scratchy fabric. She should have tried harder to prove her innocence to Principal Jackman. Should’ve made him listen. A long breath whistled through her teeth. It wouldn’t have made any difference. He wanted to be rid of her, like everyone else in her life. Teachers, foster parents, her own mother. All too happy to wash their hands and dump her onto someone else. No one cared. Why would Jackman be any different? He couldn’t wait to ship her off to Marvel’s, the east side’s alternative to regular school. Marvel was, after all, the best place to dump all the 8th grade scum no one wanted. Tara gazed from the barn to the crisp, white fences and luscious green pastures surrounding them. Marvel was known for its unusual methods in dealing with problem students. But she had totally not expected this. It had to be some kind of mistake. The other kids had moaned and groaned, certain they were headed for a work-camp, cleaning up horse crap, hauling hay, painting, and all that stuff. Listening to them, Tara had envisioned smelly, peeling barns, and broken-down fences. This was quite the opposite. The farm was actually quite tidy. Nice. Peaceful. Not the kind of place she’d expected juvies to be sent to at all. Maybe this wouldn’t be so bad after all. A leaf rustled on the path in front of her, its dry brown contrasting against the spring-green grass. It twirled and danced on the gust of wind making its way from the barn toward Tara…along with the horrible stink. She pressed a ragged sleeve to her nose. Eww! It was everywhere. Like a subway toilet that hadn’t been flushed in weeks. Who had she been kidding? This wasn’t some nursery rhyme Old McDonald’s Farm. This was a place to be disciplined and chastised. She pressed her sleeve hard against her nose. Her classmates were right—they just wanted to make them clean up the stinky horse crap. A horse screamed. A flock of sparrows took flight from the tree next to the barn, swirling into the air, a dark cloud of feathers chattering their irritation. Tara searched for the animal and jumped as it screamed again. A short, thick-necked man stumbled out, heels digging into the hard dirt as he fought to hold onto the red horse dancing in circles around him. He clung to the thick reins with one hand and pulled a leather whip from his rear pocket with the other, snapping it at the horse with a loud crack. The horse laid his ears flat, flashed a mouthful of large teeth and dove at his captor, hatred sparking in his eyes. Stumbling backward, the man let loose of the reins, surprise and fear flooding his face. Tara gasped, a small, barely audible squeak coming from her mouth. The horse spun around to face her, ears swiveling, black hooves stamping and pawing at the ground. Rage flared his black nostrils. Tara froze, a scream stuck in her throat, staring wide-eyed at the red horse. “Get back, Miss,” a voice ordered from behind her. Rough hands shoved her to the side of the path and a dark-haired man rushed forward, grabbing at the horse’s reins. The horse reared, lashing out, black mane rippling like a nest of angry snakes. The dark-haired man held on. The horse blared again, his eyes wild, white rings surrounding the black. Tara backed away as quick as she could, unable to take her eyes off the crazed horse. Her heart pounded in her ears. She wanted to get away. She needed to get away from this wild animal. Staring into the horse’s eyes, she couldn’t move. There was something…something in his eyes. She understood his look of pain. Richard stepped back toward the barn door, his face a mix of stubborn anger and impatience. Tara blinked. Jordan? Alissa Jordan? Here? The hair on the back of her neck prickled. Her stomach rolled, the acidic taste of bile rising to her throat. She forced it back down. It had to be a different Jordan. Sam stopped and stared back at Richard, anger darkening his eyes, his face turning almost as red as the horse. “I think you better mind your chores, Richard, before I do something I might regret—like tell Mr. McDonald you’ve been slacking on those stalls.” With a loud grunt, he directed the rearing horse toward a small corral between the two barns. “Let me take care of this horse,” he yelled over his shoulder. Tara shoulders tightened, anger biting at her tongue. Slacker? She wanted to scream, tell him, and everyone there, that wasn’t her. She blinked hard and retreated under her hair, letting her shoulders slump. What good would it do? Everyone assumed she was trouble because of who she was—because of who her mother was. And even though she may not be trouble, trouble always seemed to find her. Richard pushed the open barn door closed, revealing a large wheelbarrow filled to overflowing with filthy dirty straw. A black cloud of flies hummed around it like bees to honey. Tara gagged and covered her nose and mouth again with her sleeve. With a loud grunt, Richard boosted the wheelbarrow’s handles and drove the smelly refuse down a winding path, disappearing behind a large shed at the bottom of the hill. Finally, with Richard and the wheelbarrow gone, she dared to take a breath, coughing at the leftover stink, wishing she was somewhere else…anywhere but here. She didn’t belong here. Welcome C.K. and Tara. I really enjoyed the excerpt you chose to share and Tara's interview. Of course I'm a fan of the entire book. I think teens will identify with Tara's situation. Thanks for being my first guest author on the I Love Books Blog event! Sounds like a lovely read. I wish you success with your sales. I think the concept will go over great with the Tweens. I have read this book folks and anybody would enjoy it! It has something for everybody! Tammy, I agree. Very clever to talk directly to Tara. Penny, you're so right. This book is a winner! Lorrie, you'll like it for sure. Just take our recommendation!! Sounds so sad, heart wrenching even. Congrats, CK. Sounds like a great book. Tara is a wonderful character. I love her voice. Off to visit you over at CK's blog, Janet. What a great interview! Very moving and I look forward to reading the book! Tara, your story sounds very compelling, please congratulate Charlie for me on her success. JQ, you have done it again, my friend. 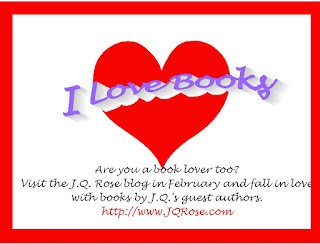 I wish you much success with your I Love Books Blog! Very enjoyable character interview. I was a city kid who always wanted a horse. Never got a real one, but I love horse stories, and this one sounds like a winner. Best to you both, C.K. and Tara! Greetings all. Sorry to be slow in chiming in. I am so honored to have J.Q. on my site today. And I'm honored to have this talented writer as my friend! Many kudos to her and her stories. Write on, Sister! Thanks, Scott and Joylene. I never had a horse either, but luckily my girlfriend lived on a farm so we rode her big horse and a little pony. We would giggle so hard while we rode, we fell off the pony. Good times. Thanks, Charlie. You are hosting me on your blog with such a magnificent title, J.Q. Rose, Author Extaordinaire.. Makes me blush. Great interview, Charlie. I like that it is in Tara voice. Love the book.